I still have a sense of wonder about the city where I have lived almost my entire adulthood. So much to do and see, from sports and culture to nature. In this case: First Friday Dupont, where once a month a handful of Washington art galleries throw open their doors for a public party. Think of it as a pub crawl with art. Thanks to a tip from my friend Chris, the art enthusiast, we walked from gallery to gallery, savoring a bit of wine, a cracker with cheese and some amazing art. First a word about Chris. We have known Chris and Jeff forever (and I’ll leave it at that), and it’s always great when you discover a new side to an old friend. Quite simply, Chris opened my eyes to art. If you go to an art gallery or a museum or even a garden with Chris, she helps you understand the symbolism, the history, the back story. She is a docent at the National Gallery of Art and she helps you find things in paintings or sketches or sculpture that the casual observer (me) would never see. 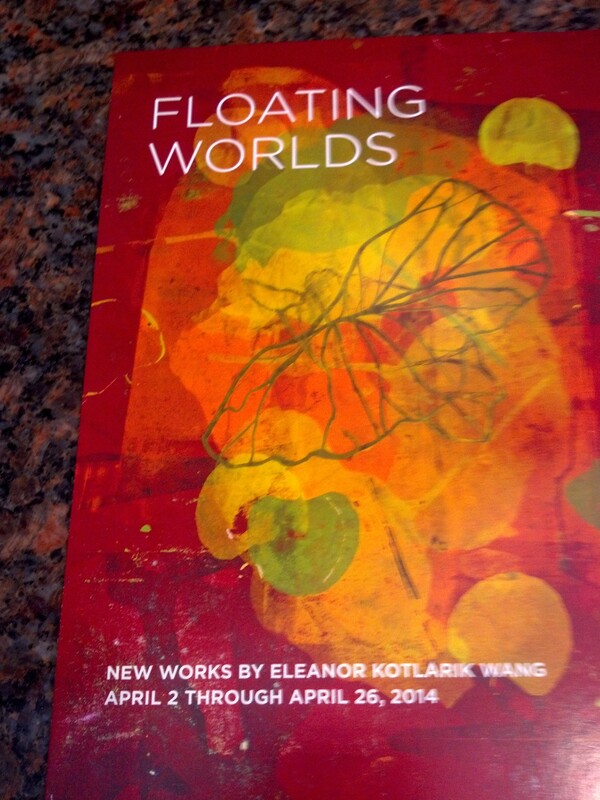 Our first stop Friday night was a gallery showing the works of their friend Eleanor Kotlarik Wang. Using paper, wood and canvas, Eleanor layers silkscreened images with paint and then applies sanding and scratches. The result, as her website says, is “Organic forms (that) appear to float … They are airy, free and unattached to any sense of space or time.” The colors were amazing, ranging from royal blues and purples to yellows and oranges and deep red touched by gold. It was a thrill to hear Eleanor talk about her art as we strolled from frame to frame. At another gallery, tucked away in a historic carriage house, we were wowed by the work of a Bulgarian artist, Kiril Jeliazkov. Huge paintings in vibrant colors depicted Brazilian dancers, a street scene at the Eiffel Tower, a café in Paris, and taxis crowding dusky New York street. His public art has been exhibited around the world, including a PGA golf tournament in Palm Beach. At the end of the night, we made a pact to spend more First Fridays at Dupont Circle, then drifted toward home thinking about art.